Steve Potter has been creating with wood for over 40 years! He taught for 35 years in public education as an industrial arts teacher in the Connecticut public school system. Upon retiring, he and his wife Jan settled in Eastham, Massachusetts. Steve has been a skilled woodworker even longer, creating everything from fine furniture to cedar strip canoes to antique reproduction Windsor chairs. Steve likes to think that mother nature would be proud of what he has done with her wood. 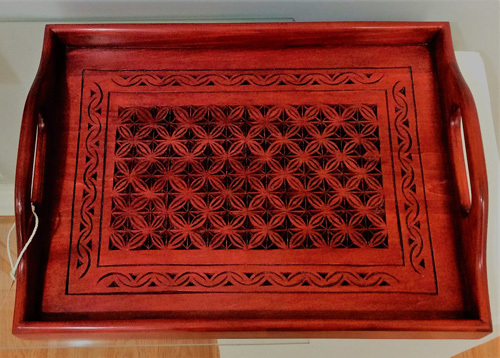 Steve recently began practicing the ancient art of chip carving and incorporates his carvings into his hand made serving trays. He uses nothing more than a carving knife after laying out a design directly onto the wood using a pencil, a compass, and a straight edge. His designs are carved on basswood, a premium carving wood. The remainder of the tray is made from eastern white pine to maintain the lightness of the tray.